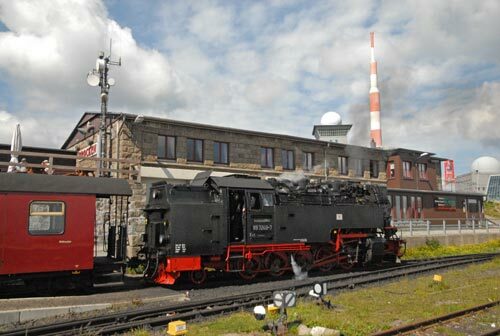 The Harzer Schmalspurbahnen (Harz Narrow Gauge Railways) offers one of the finest excursions on a steam hauled train in Germany. The main hub for the 140km metre gauge network is at Wernigerode where steam locos are serviced and prepared for trains. Wernigerode lies on the main line from Hannover to Halle (Saale) and can be reached easily by train. The most popular destination for visitors is the Brocken, an area of high ground which was used by the Russians as a listening post in the days of a divided Germany. The old border between East and West ran a few kilometres to the west of the summit. Steam haulage on the route to the Brocken is guaranteed but on other lines in the network diesel railcars are used for some services. The mainstay of the fleet are chunky 2-10-2Ts that were built in the 1950's. However there remains one loco dating from the pre-war period, 99 222. In addition two 0-4-4-0T Mallets are used for special trains which are advertised on the railway's website. The journey starts from the spacious HSB station adjacent to the mainline station. If you are there early then a walk down the platform to the observation platform is worthwhile as you will get a good view of the locos being watered, coaled and oiled ready for their day on the line. From the start the line makes for the first station at Westentor, where the main workshops are located on the right just before the station. From here the train crosses a busy road junction before heading out through the suburbs. Do remember that you are allowed to stand on the end balconies of the carriages so if you want to be close to the engine get somewhere near the front. The line leaves the town after Wernigerode Hochschule Harz, which must be one of the few remaining schools with its own steam operated train station. From here the line starts to climb into the hills following a twisting course through the forests. Further stops are made before reaching the junction station of Drei Annen Hohne where the trains stops for the loco to take water. After restarting the train bears right with the main line to Nordhausen going left. The train continues to climb as it twists and turns through the forests to reach Schierke where more water is taken for the final stage of the journey to the Brocken. From here the views begin to open up as the train climbs steeply. On the left you will get your first glimpse of the Brocken summit, which is reached by taking a circuitous route around the mountain. The trains does in fact go full circle to reach the station. The Brocken offers some fine views in all directions including a view down to Wernigerode. There are a couple of places to buy refreshments and there are signed walks and a garden. The return journey follows the same pattern with two water stops as on the uphill journey. However before reaching Schierke the train is put into a siding to allow the next uphill train to pass. To regain the line the train is reversed before continuing its descent. Overall the journey is quite relaxed and with leisurely breaks at two stations en-route.